I decided I was going to make some Christmas presents. Before I even took anything out of the box... I jumped onto the internet and starting googling Yudu tutorials, tips and tricks, etc etc. I found some of them very helpful, some of them not so much, and some just out-right annoying videos. Once I thought I knew what I was doing, I opened the box. It was fun, like Christmas come early. I love new toys. And I really have to say, I love my Yudu. With that said, it wasn't out-of-the-box easy... and in fact I am still learning. My Yudu DID NOT come with the manual it claims was in the box on the instructional DVD. I had to download it from their website. The emulsion sheets, that come in the box... are awful. I had read that they were not cost effective (and this is correct....), and that most people screwed up applying their first sheet. And so did I. Not only did I screw up the first one, but the second one as well. This is when I decided to take a trip to the Art store and apply the emulsion the old fashion way. I bought liquid emulsion. It works great in terms of burning the screen.... applying the emulsion is where I am still out of practice. For some reason, I remember it being easy in college... pull the emulsion up the screen with a scoop-coater and you get a nice even coat of emulsion. Right now I cant seem to get the nice even coat. I'm slightly drippy. Every screen I coat gets better... so I am thinking I am out of practice. Using inks other than Yudu brand ink... I had read that it was fine to use other inks. This is technically true... however, I did find that the Yudu ink because of its thickness- was much less runny and produced a crisper result. The other brand I found to work well was the Jacquard inks found in AC Moore or Jo-Anns. 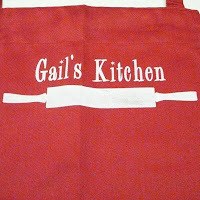 For Christmas, I made aprons for my mother, and a set of dish towel/pot holders for D's mom. I thought I was just going to print directly onto each thing... but when I printed the first pot-holder wrong (completely off center).... I decided to go in a different direction. I printed my design onto a piece of fabric, then sewed everything. together. The final result looked great. 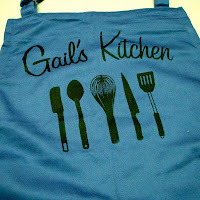 I printed two designs directly onto aprons for my mother, and then did 1 the way I did the pot-holders/ and towels above. 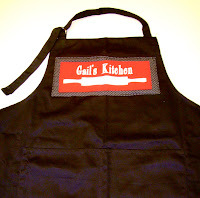 The extra fabric makes the aprons look cute, but I like both ways. She loved them all. Love those projects!! You did a great job. :) I can't wait to see what else you make. Yuduing is SO much fun...there's so many surfaces you can screen print on that it gets quite addicting. thanks for the comment Erin! your blog was one of the ones I looked at before I started!